I’ve been exploring Alloy for the past few months and it’s raised the interesting problem of how to best display relational data within tables. There are plenty of data visualization resources on designing charts (scatter plots, bar charts, line charts, etc.) and tables (summary statistics, pivot tables) of quantitative data, but I haven’t been able to find much about tables of relational, mostly non-quantitative data. I’m interested in exploring something akin to the grammar of graphics, but for relational data tables. This should make more sense after an example. How do you measure 4 quarts using just a 5 quart jug and 3 quart jug? 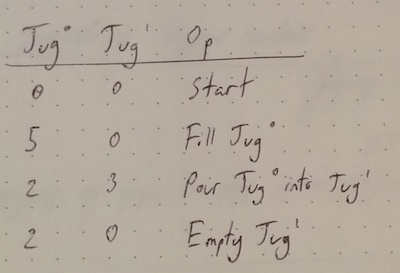 Here we have three tables: One with our two jugs, one with an instance of a Pour operation (from jug0 to jug1), and one with the list of steps required to solve the puzzle (start with the jugs empty, then fill the 5-quart jug, pour as much as you can into the 3-quart jug, etc.). The tables are shown in a completely normal form: There’s one table for every signature, with rows corresponding to atoms and columns corresponding to fields (if a field has multiple values, the values are stacked; if a value is itself a relation, subcolumns are drawn; the jugAmounts field of State demonstrates both situations). Together these tables show the full solution, but it’s not particularly easy to read or understand. I can think of three kinds of transformations to this normalized view that would be helpful for specifying clearer presentational tables. The first transformation is joining; combining fields from multiple signatures into a single table. 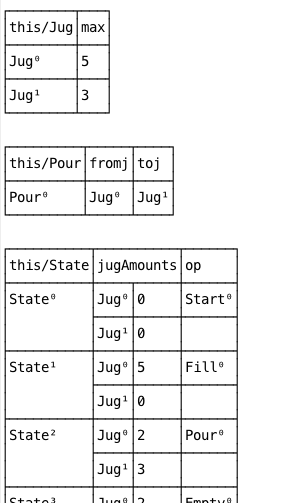 In the jug example, joins must be performed manually by looking between tables. 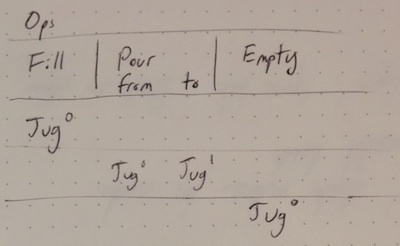 E.g., the State2 atom in the State table is associated with the pour0 atom, but one must refer to the Pour table to see what jug you’re supposed to pour into what. Joining would not only allow us to avoid a manual lookup, it would also allow us to hide entirely the pour0 atom. This would definitely be an improvement, since a Pour atom is synthetic. That is, unlike a jug atom (which represents a physical jug), the Pour atoms (and all other atoms derived from op) exist only to encode instructions that the puzzle-solver needs to perform. Then one could look at one table and read out everything they need, row-by-row: Fill jug0, pour from jug0 into jug1, empty jug0, etc. The second kind of transformation to improve presentation is transformation of the instance data itself (the atoms, tuples, and relations). Rather than an explicit join to introduce new columns, one could specify a render function that maps, e.g., the pour0 atom to the string “Pour from jug0 to jug1”. The resulting “table” would then be a simple list of steps. This kind of functionality would be particularly useful for rendering out complex presentational markup. E.g., instead of displaying an atom as Person7, the function could examine the appropriate fields (or other relations) to generate markup containing a profile picture, full name, etc. Some kind of mechanism to specify render functions to a context (like CSS selectors or other aspect-oriented programming approach). I.e., we want the transformation only in the context of the State table’s op column; it shouldn’t transform atoms that appear in the Pour table. Can the underlying Alloy types be used to enforce, e.g., exhaustive pattern matches within render functions? How much power do the higher-order render functions need to be useful for presentation? Can they filter or synthesize new data, or should such operations be handled within the underlying Alloy model? Alloy’s table visualization is “tidy” in Hadley Wickham’s tidy data sense: columns correspond to fields and rows to atoms and their field values. How are missing values indicated, in case a row doesn’t contain the relevant tuple? How does this generalize to tuples of arity greater than 2? Is the first tuple value promoted to a column, and the rest drawn as inlined subcolumns? Such constraints could be visualized using header icons, cell shading, placeholder values, etc. However, other constraints may be more difficult to show. E.g., Alloy subtypes are disjoint, so in the joined table example above all, exactly one set of columns from the Op-derived signatures (Pour, Empty, Fill) may be filled for any given row. How could this be indicated visually? Of course, not all model constraints are going to be possible to draw visually (if they could be, you probably would’ve already solved your problem on paper rather than turning to a formal modeling tool + SAT-solvers). Would visualizing simple constraints but omitting the impossible-to-visualize complex constraints cause people to misinterpret the underlying model by conveying a false sense of complete understanding? Rendering a collection as a list/table requires ordering the elements. But since Alloy relations are sets, their order is arbitrary. Fields (columns) can be ordered according to source order (i.e., based on where they are defined in the textual Alloy code), though there may be presentational situations where you’d want to specify a different order. Existing typechecker catches issues related to typo’d signatures, fields, etc. Enables complex markup, exporting PDFs/graphics, etc. Software Abstractions, by Daniel Jackson. A great intro book on formal modeling / logic and Alloy. Email me if you have any questions, relevant personal experiences, or want to collaborate.